House, 3 Bedrooms, 4 Baths...Private Casita. Desirable Rancho Mirage location. Huge one acre lot. Two Blocks from hwy 111. 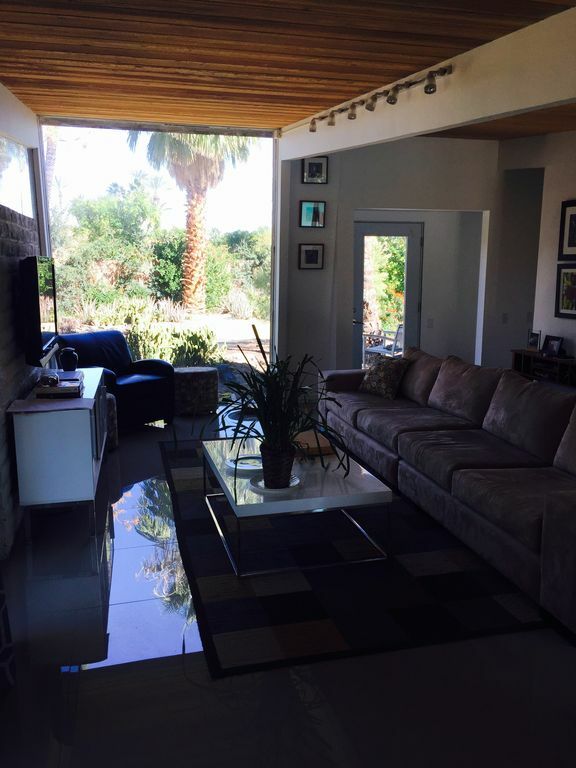 Gated, tastefully furnished Mid-Century Modern 3 + 4 Baths. Casita with king size bed, shower, sink, and marine toilet. All Bedrooms have attached baths. Sand Blasted wood Ceilings, , kitchen with island, stainless, Open floor plan. Laundry. Coachella, 3 night min $870/ nt. Stagecoach weekend, 3 night min. $650/ night Outdoor living, three separate patio areas. covered loggia landscaped private yard with Mountain Views. Rear yard features' pool/spa. New patio furniture. Gated. Walking distance to Restaurant Row in Rancho Mirage. located in an area where homes are on one acre lots. neighbors have goats, and horses. One block away is a wonderful hiking trail and bridal path overlooking the Morning side CC golf course. Close to Palm Desert's beautiful shopping street El Paseo Drive, downtown Palm Springs, and Indian Wells Tennis Garden. Keywords: House, Palm Springs, Coachella Festival, Tennis, Stagecoach, mountain views. Spa heated, Add'l charge of $100/day to heat pool. My husband and I traveled to Palm Springs with another couple to escape the last little bit of winter. We knew we made the right choice as soon as we pulled into the driveway. The sun was warm and the light breeze was filled with the fragrance of the many citrus trees that were in full bloom around the house. Our GPS apparently did not account for the time we would save using the HOV lane on our drive in, but despite our early arrival taking Dave by surprise he took it all in stride. He was responsive, professional and always a pleasure to deal with. The house was perfect for our group. We had total privacy when we wanted it and lots of room to stretch out. There was a bed for every preference, plenty of linens, and the ice machine kept pace with four thirsty adults. Having a washer and dryer on site meant that I could have packed half of the gear that I did. Being on Eastern Standard Time when we arrived, our first few mornings were early ones so we enjoyed our coffee on the patio watching the sunrise and the light change on the mountains. The view of the mountains from the patio is incredible! We took full advantage of the pool and the hot tub was perfect for soaking tired muscles after our many hikes. Hot Tip: the patio off the living room is the perfect spot for sneaking in an afternoon siesta. The neighborhood was safe and quiet. The hummingbirds made more noise than the neighbors. Our first meal in town was at Catalan Mediterranean just a few blocks away. That was arguably our best meal of the trip, and it was just a short walk away! Modern home in Rancho Mirage. Glad you appreciated the private, nature filled setting, and large lot. You were great guests, and are welcome back anytime. We had a great time at Dave's lovely home in Rancho Mirage. This was our second stay at his house. His house has 4 great bedrooms, pool and the property is beautiful. Very private and on a lovely, quiet street. We will be back. Highly recommend this property to rent. marge c.I live in Sutter Creek, CA. Wonderful backyard, patio and pool area. Great hot tub, refrig and lots of ice. Kitchen well-equipped, beds comfortable. Living area very comfortable. Great vibes. The casita was not to our liking, nor was it necessary, but the main house was really livable. Thank you. Also the walking path just down the street was nice to have. We had a wonderful visit in the desert. The house and property were wonderful. Love the views of the mountains. The backyard pool area is so private and peaceful. We love the 1950s house. The architecture took us back in time. We will be back.